People kept recommending this series to me, so I went looking for it on Netflix. The series concept and characters were created by Yoshitoshi ABe (that’s how he spells it), and was produced by yasuyuki ueda (also sic), both of whom worked together on Serial Experiments: Lain. What Lain and Haibane Renmei together seem to indicate is that the creators are using the medium of anime to make 13-episode, stylized, moody, highly original art films. Which is fine with me. It beats the hell out of watching Warhol’s Empire for eight hours. We open with a young woman falling head-first from a lovely blue-and-white sky. She is garbed in a white robe, and accompanied by a crow who interacts with her in a lively way, then tries to support her by tugging on the hem of her robe. The crow fails, and the girl continues to plummet toward the earth. The Haibane live in an old mansion called Old Home. (The English words are used throughout.) Old Home is in a town called Guri, which is filled with normal people. The technology level seems to be late 20th Century, though there are no automobiles as there is no place to drive. Electric power is provided by a wind farm. The town and its environs is surrounded by a wall which the inhabitants are forbidden to touch or even to approach. Beings called Toga— they look like masked humans garbed like shamans— are the only people allowed through the gate, and they bring things from outside that the townsfolk can’t make for themselves. The Haibane get their names from the dreams they experienced while in their coccoons. 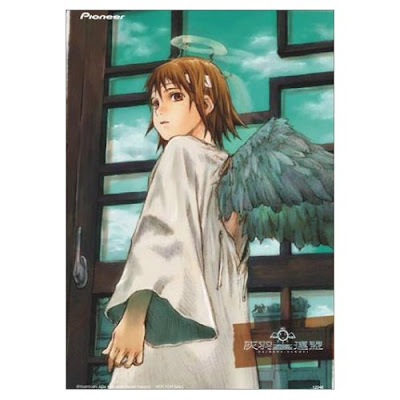 (“Rakka” means “falling.”) The elder Haibane (all of whom are female) have jobs in town, but are forbidden to own money. Instead they get coupon books that allow them to purchase goods. The folks in town consider it good luck to give them things. There is another group of Haibane, both girls and boys, that live in an abandoned factory on the other side of town, but there is unexplained tension between the two. The opening episodes consist of Haibane and people being extremely kind to one another, and for a while I wondered if there was going to be any conflict at all. Trouble enters paradise when one of the Haibane, um, dies. Turns out that sometimes a Haibane will get an urge to wander off into the Western Woods, then on their “Day of Flight” turn into a beam of light that shoots up into the sky. Rakka witnesses this and gets terribly upset. (It may be my personal take on this, but I’d find death a lot less ominous if people shot up into the sky as a beam of light . . . It would seem a hopeful sign to me.) Rakka then spends several episodes asking anguished existential questions. Her wing feathers begin to turn black. Her particular friend Reki (“Gravel”) gives her medicine that washes her feathers clean again, but explains that the black feathers are a pretty dreadful sign. It is strongly suggested that the Haibane are recently reincarnated humans, placed within the sheltering walls of Guri in order to work through traumatic episodes in their past lives. (Since none can remember their past lives, this is actually a tall order.) Those who can’t work out their problems become “Sin-Bound,” and their feathers turn black. If they’re still Sin-Bound when their Day of Flight comes, Something Bad happens to them. The last few episodes chronicle Rakka’s desperate attempts to save her Sin-Bound friend before the Day of Flight comes. It’s significant that the Haibanes’ dreams are so important, because the whole series has a dreamlike quality that sets its action in a place beyond our reality. The series is very gentle and slow moving, and there are no villains anywhere in the story, only people who need help and other people willing, if not always able, to help them. At times I grew frustrated with the series’ slow pace— you could pack the whole story into a two-hour feature without losing much of the story— but on the other hand it was sometimes a relief to spent time with some genuinely nice, if not precisely angelic, people. The story seems a highly personal work from Mr. ABe, a working out of his own private symbol set. The wings and halos are borrowed from Christian imagery, but the metaphysical setup is far from Christian. And it’s lovely to look at. If you think you might like a series about nice folks in which nothing blows up, then this may be the thing for you. …you should probably try Aria the Animation next — a title where nothing much happens, but it does it in a very stylish and relaxing fashion, in an idealized version of Venice. Otherwise, after reviewing two ABe titles, people will start suggesting Texhnolyze at you, which is done in a very different and down-beat style. Haibane was in a completely different style, and a completely different tone, than Lain, so I’m not surprised if the other projects are different as well. I’m always interested in artists who refuse to stay in any single niche. Partly because, let’s face it, I’m a lot like that myself. The new Knight Rider TV show is another show were nothing much happens (After they lost the Ford sponsorship). I know they needed to find a new automotive sponsor. I know KITT had to change. Could the have found anyone other than Vespa Scooters? Changing the lead character from Michael Night to his 15 year old kid sister Michelle had to change the shape of the conflict. I don’t think the show has quite the same level of action. Now: Two guys asked me to the dance, what should I do? I think I read somewhere that the creator said that there was a third community of adult Haibane within the walls somewhere, but it just never came up in the plot. The tension between the Old Home group and the abandoned factory group seems to be due to an incident a few years back which is described in the show. I don’t know if there was some deeper cause. What happens to those who fail to overcome being sin bound is described. They live out normal lifespans away from everyone else, as hermits. Although it may be that they become the Tooga or the never speaking monks of the Haibane Renmei, the quasi-religious group that govern haibane affairs and control the trade with the Tooga. I know all that, CB, I was just trying to avoid too many spoilers. Sounds pretty cool. I’ve added it to my ever-longer One of These Days list.